Carla is a bone obsessed nature lover living in the farm country surrounding Salem, OR. She began teaching herself the art of bone preservation many years ago while working on a goat meat ranch and being inspired to clean the beautifully horned skulls of the bucks that they were harvesting for meat. Over the years, she has refined her craft to produce impeccably cleaned bones that can be passed down for generations. She uses a colony of flesh-eating dermestid beetles along with other processes, both natural and chemical, to achieve excellent quality specimens. She also does bone painting, metalizing, and repair and restoration of bones, horns and antlers. More information about her services can be found at Dermestidarium.com. Laura Tempest Zakroff is a professional artist, author, dancer, designer, and witch based in Seattle, Washington. She received her BFA in Printmaking from the Rhode Island School of Design (RISD), and trained at Fleisher Art Memorial in Philadelphia and the South Carolina Governor’s School for the Arts. Her artwork embodies myth and the esoteric through her drawings and paintings, jewelry, talismans, and other designs, receiving awards and honors worldwide, and has been published in numerous books and magazines. She blogs at Patheos as A Modern Traditional Witch and at Witches & Pagans as Fine Art Witchery. Her first book, The Witch’s Cauldron, is due out from Llewellyn Worldwide in May 2017. Amanda Fisher is a Portland-based artist and educator. She has spent over a decade developing and teaching classes to youth on a wide variety of science topics, and more recently discovered how to combine her love of science education with her craft of creating jewelry. Midnight Snack Jewelry features the bones of rodents, birds, and shrew dissected from owl pellets found locally on Sauvie Island. Each bone has been eaten, regurgitated, dissected, and reconstructed into wearable artwork! Paul worked on his doctorate in Alaska and post doc in Alberta. He was an environmental consultant in the western states for over 35 years. His specialty was wildlife ecology, wetland science and ecological risk assessment. Volunteer work includes board positions on the Tualatin River Keepers and Salmon Safe. Oregon Mycological Society volunteer activities include leading field trips to the Coast Range and to a diversity of natural areas in Tigard. Paul is very interested in mushroom reproduction and will share what he has learned with anybody who will listen. Betsy Tinney is a Northwest cellist and composer whose solo cello work has been called “captivating,” “mesmerizing,” and “a rich texture for the ear, reminiscent of fine dark chocolate and red wine.” Betsy also performs with many different groups (from acoustic singer/songwriters to rock bands), does session work, and teaches. When not behind her cello, Betsy is a web designer/developer and part-time pixie. Website: www.betsytinney.com. Leah Kiczula is a photographer, print maker, and artist living and working in Portland, OR. She is a graduate of Marylhurst University in Interdisciplinary Studies and the Pacific Northwest College of Art in Fine Art. Leah is interested in myth, legend, folk lore, and fairy tales which heavily influences her work. She creates in many mediums including photography, photogravure, relief, and lithography, including the combination of multiple forms. Aside from art, Leah is a lover of heavy metal who enjoys a good show, floating down rivers in the summer, and listening to history podcasts. Marilyn Kent has been creating art in many media for many a year, but presently is interested in the drawings and diagrams featured in vintage scientific textbooks – particularly biology textbooks. Her favorite book is Animals Without Backbones, which she read at 7 years of age. When not at the art table making Cornell-like boxes and Found Object shrines, she bikes in her home town of Eugene and likes to bird watch. As a Library Clerk at the Eugene Public Library she has access to information and images daily, and her mind is almost permanently boggled. Jenn Woodward is an artist and small business owner living and working in Portland, OR. With a background focused on mixed media installation, drawing and papermaking, Jenn is currently exploring the relationship between local and sustainable materials and the themes of empathy, identity and mindfulness in her art practice. After attending the High School for Performing & Visual Arts in Houston, she received her BFA from Sarah Lawrence College, and her MFA from the joint degree program at The School of the Museum of Fine Arts, Boston & Tufts University in 2006. In fall 2012 Jenn and her husband Gary A. Hanson established Pulp & Deckle, a community papermaking studio that offers workshops, demos, custom orders and a papermaking artist residency program in partnership with the non-profit organization, c3:initiative. In addition to teaching at the studio Jenn is a guest instructor at locations throughout Oregon, including Sitka Center for Art & Ecology, Portland Community College and WildCraft Studio School. Darien Skullgrrl is a crossover artist focused on showcasing the natural beauty of the formerly living. Melding science and artistry, she creates dolls, sculptures and jewelry based on the natural forms inherent in all creatures to bring enjoyment to those who appreciate biology and art equally. Vandy is a multimedia artist and glass blower who makes functional and decorative art with the goal of bringing magic, the unusual, and often the absurd into peoples’ every-day lives. She attended Portland State University, receiving an honors degree in Sculpture and Art History. Vandy has been an intern at the Smithsonian Institution, studied and assisted teaching at the Corning Museum of Glass in New York, and participated in several historical glass furnace projects. When not making art, Vandy enjoys travel, the outdoors, waterfalls, storms, spinning, historical reenactment, juggling, rock climbing, caving, vintage video games, and circus arts. She lives on a small farm near Portland, Oregon, with her partner, three cats, two angora goats, and a flock of chickens. Cheri Cloninger is a biotechnologist with a BFA from New York University, BS in Biotechnology/Medical Technology from California State University, and is wrapping up her MS in Biology here at Portland State University. She is a partner in the Portland Insectarium, and owns the 20 ft. mobile museum which will bring the joy of insects to the masses (www.pdxinsectarium.org). 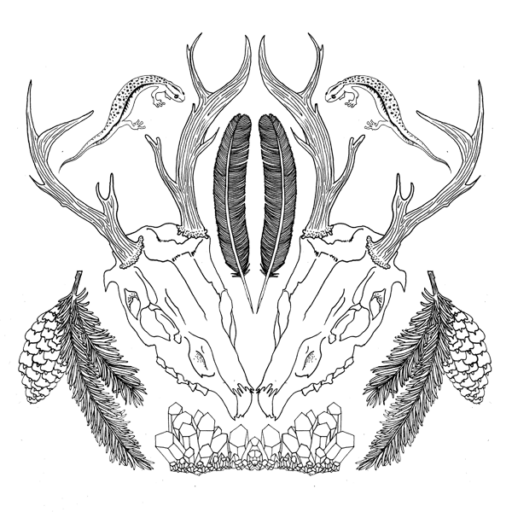 As an Alaskan raised in the wild, she is fascinated by nature and makes jewelry and other artwork out of dead things. See Cheri’s passion for science through different media of art, including photography, painting and poetry at her webpage in progress: intimatescience.squarespace.com.